Greater gallantry than was shown by officers and men could hardly be desired. The (troops) were burning with an impulse to do honor to their race, and rushed forward with intense enthusiasm, in face of a terrible fire." History and Organization of the USCT The U.S. War Department began the recruitment of African-American soldiers in 1863, forming what eventually became known as the "United States Colored Troops." By the end of the war approximately 200,000 former slaves and free blacks had served in Federal army ranks. Per army regulations, USCT units were led by white officers. USCT units fought in several battles during the Civil War notably including at Port Hudson, Louisiana; Petersburg, Virginia; and Nashville in addition to Blakeley. 2. 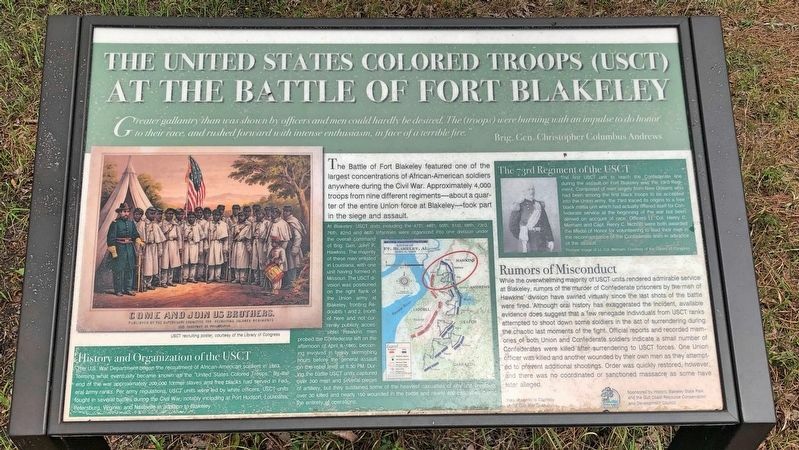 USCT at the Battle of Fort Blakeley Marker on left. Blakeley featured one of the largest concentrations of African-American soldiers anywhere during the Civil War. 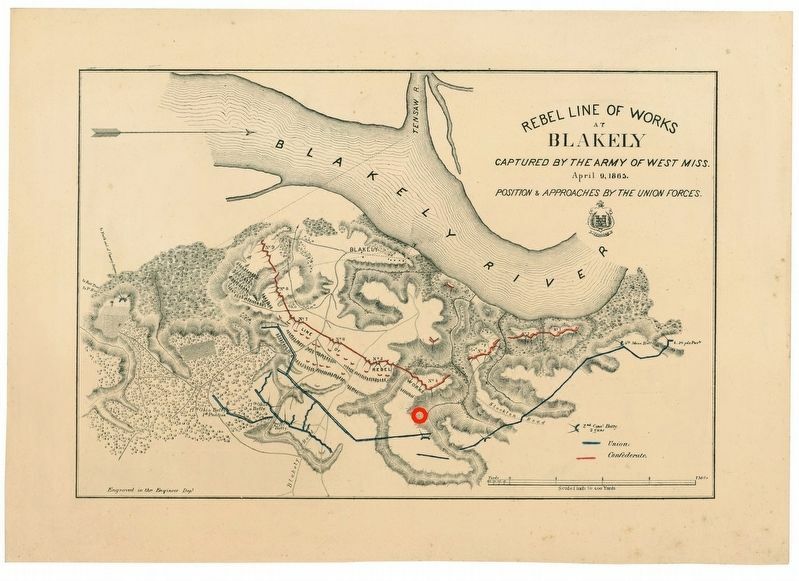 Approximately 4,000 troops from nine different regiments—about a quarter of the entire Union force at Blakeley took part in the siege and assault. 3. Rebel Line of Works showing the Union initial line (red circle is marker). in the battle and nearly 400 casualties during the entirety of operations. The first USCT unit to reach the Confederate line during the assault on Fort Blakeley was the 73rd Regiment. Composed of men largely from New Orleans who had been among the first black troops to be accepted into the Union army, the 73rd traced its origins to a free black militia unit which had actually offered itself for Confederate service at the beginning of the war but been denied on account of race. Officers Lt. Col. Henry C. Merriam and Capt. Henry C. Nichols were both awarded the Medal of Honor for volunteering to lead their men in the reconnaissance of the Confederate lines in advance of the assault. 4. Union General John Parker Hawkins. that a few renegade individuals from USCT ranks attempted to shoot down some soldiers in the act of surrendering during the chaotic last moments of the fight. Official reports and recorded memories of both Union and Confederate soldiers indicate a small number of Confederates were killed after surrendering to USCT forces. One Union officer was killed and another wounded by their own men as they attempted to prevent additional shootings. Order was quickly restored, however, and there was no coordinated or sanctioned massacre as some have later alleged. With the 73rd Infantry Regiment, United States Colored Troops, he led the attack on Confederate positions at Fort Blakely on April 9, 1865. 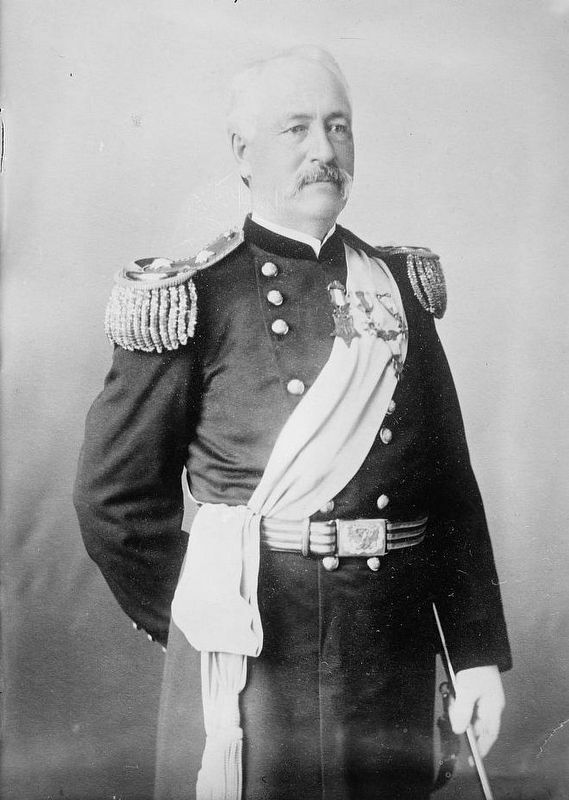 For these actions, he was brevetted colonel and, several decades later on June 28, 1894, awarded the Medal of Honor. His official Medal of Honor citation reads: "Volunteered to attack the enemy's works in advance of orders and, upon permission being given, made a most gallant assault." in Historic Blakeley State Park. Marker is at or near this postal address: Battlefield Road, Spanish Fort AL 36527, United States of America. Touch for directions. Other nearby markers. At least 8 other markers are within walking distance of this marker. 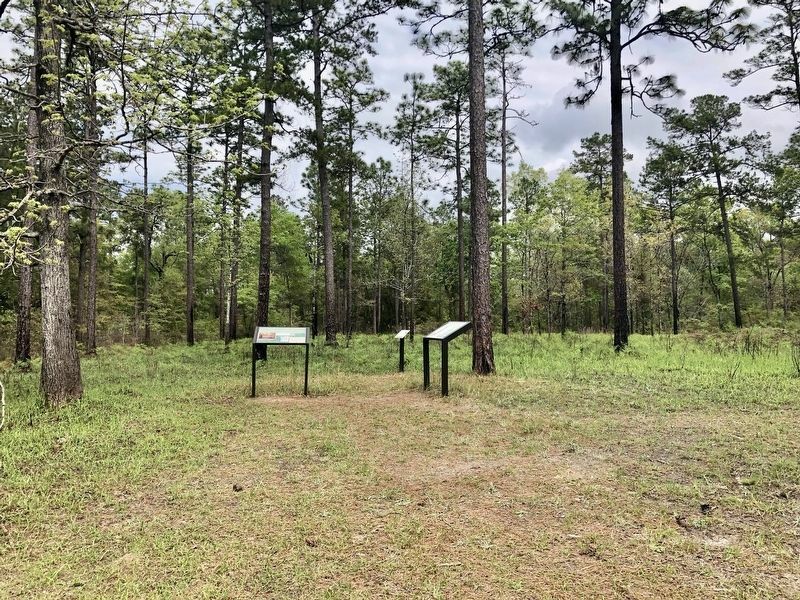 The Siege of Fort Blakeley (here, next to this marker); The Battle of Fort Blakeley (about 600 feet away, measured in a direct line); Fort Blakeley (Fort Blakely*) (about 600 feet away); The Battle of Fort Blakely (approx. 0.2 miles away); Alabama (approx. 0.6 miles away); Battle of Blakeley (approx. 0.6 miles away); Redoubt Six (approx. 0.6 miles away); Union Artillery Batteries (approx. 0.8 miles away). Touch for a list and map of all markers in Blakeley. Regarding The United States Colored Troops (USCT) at the Battle of Fort Blakeley. The 73rd suffered three killed and twenty-seven wounded in the attack, their last casualties of the war. One of the wounded was the only black officer, Captain Louis B. Snaer, who received a serious shell wound of the foot during the final charge. 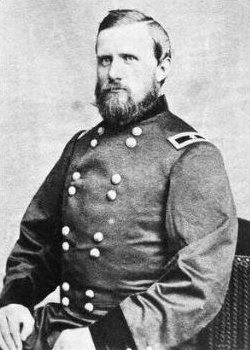 His white commander's report stated Captain Snaer fell with a serious wound at my feet as I reached the line. He refused to sheathe his sword or to be carried off the field. No braver officer has ever honored any flag. The 73rd Infantry USCT, which began as the Louisiana Native Guard, was demobilized on 23 September 1865. More. Search the internet for The United States Colored Troops (USCT) at the Battle of Fort Blakeley. Credits. This page was last revised on April 9, 2019. This page originally submitted on April 8, 2019, by Mark Hilton of Montgomery, Alabama. This page has been viewed 41 times since then. Photos: 1, 2, 3, 4, 5. submitted on April 8, 2019, by Mark Hilton of Montgomery, Alabama.